The foundation stone for Kailash Bahl DAV Centenary Public School, Chandigarh was laid on 1st February 1994 by Principal B.S. Bahl, Vice President DAV CMC, New Delhi and Chairman of the School. Mrs. Madhu Bahl was appointed as the founder Principal and given the responsibility to start a public a in Sector 7-B, Chandigarh with 3 acre land which was totally undeveloped. The School started its first session in April with the admission of 94 students, up to Class I, with 4 teachers in 4 classrooms. Within a span of one year, the School had a strength of 350 students in the session 1995. With the hard work of Principal Madhu Bahl and her team, the School build its place amongst the best public schools in the tri-city. In October 1995, the school was later renamed as Kailash Bahl DAV Centenary Public School in memory of Mrs. Kailash Bahl, wife of Mr. B.S. Bahl who had suddenly passed away in June 1995. The Bahl Family started a Trust to lend financial assistance and support to the school. Dr. Arun Bahl directed the proceeds from one of his best selling chemistry books to the trust which has been awarding scholarships to the poor & needy students of the school. The books are donated to the school library through the Kailash Bahl – B.S. Bahl Educational & Charitable Trust. Every year, the best seven teachers of the session are awarded by this trust on Teachers Day. KB DAV-7 has strength of 2600 students, up to Senior Secondary level. The modern science block of the school came up in 2005 to hold Senior Secondary classes and was named as B.S. Bahl Science Block. The generous financial contributions by Mr. B.S. Bahl & his sons has been of paramount importance in establishing the school . The school excels in academics, cultural, social and sports. The school had made its name in the field of Roller Skating up to International level. School has won accolades in both scholastic and co- scholastic area for the past many years and continues to excel in CBSE Class X & XII board examinations results. Principal Mrs. Madhu Bahl was given the unique opportunity to give shape to her first initiative, for which she left no stone unturned. 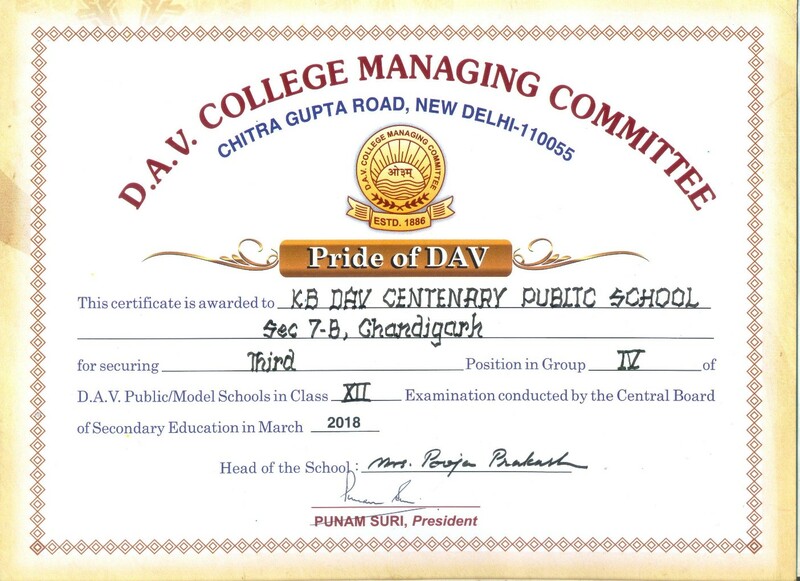 Today, the most striking facet of KBDAV-7, Chandigarh is that it is a reflection of her untiring efforts, showcasing the diversity of minds, thoughts, creativity and skills of the children of the school. The school lays special emphasis on both academic and co-scholastic areas providing the students an edge over others. I congratulate the Principal for the school's success in all spheres and wish her the best for all future endeavours.